This Easter break was very fruitful for me. In fact I was quite satisfied with the work that I did in the last few days. In the past few weeks I am following IndieWeb principles and I implemented POSSE as well. I was quite satisfied with the new approach on my blog where I started posting small updates using notes. However I also wanted to implement checkins on the site and I shared the approach I took with my Drupal website and the modules I used to achieve it. However I still wanted this ability to display my current location on my site. I was actually inspired by Aaron Parecki. I wanted to do the same thing and I first thought of using his code which he open sourced but I wanted to do it myself and also I don't have an iPhone plus my site runs on Drupal and I was more comfortable implementing it myself. If you go to the status page you will be able to check my last known location and the battery status coming directly from my phone. I want to share the work that I did to achieve this. In case it is not clear or you need more information. Please contact me and I will be more than happy to share more details. Yes I love Blackberry and I use it in 2018 as well. It is great and don't ask me to change it. I use this android app running on my Blackberry Passport. 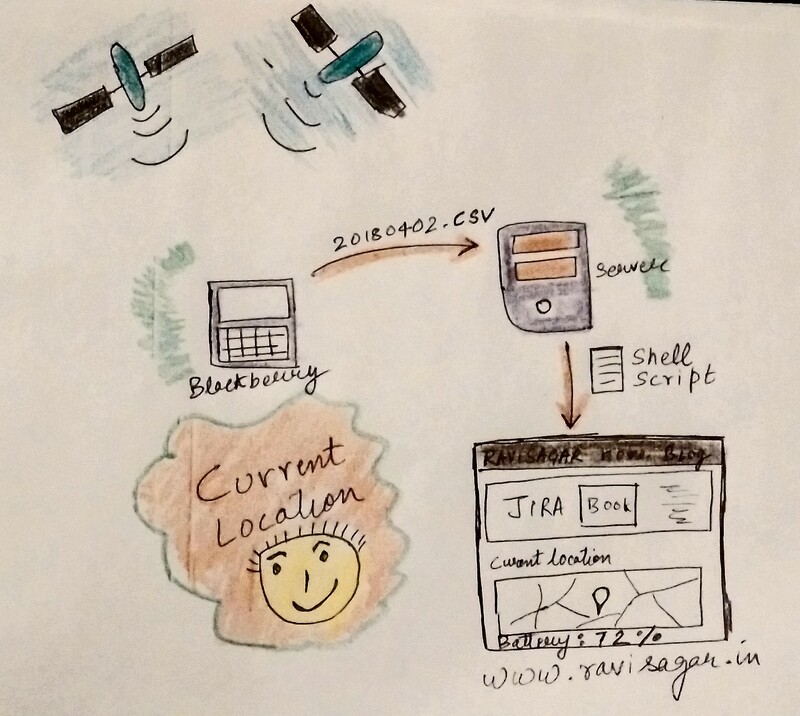 This app captures the GPS location and creates a GPX and CSV file which I also send to my server using secure connection. To save battery of my Blackberry, which is anyways great as compared to Android phones but I still wanted to make it last longer, I did some settings in the app as follows. Anything which is better for the battery is not good for the GPS. I can log more frequently and make GPS very very accurate but it will drain the phone battery quickly. This is my favourite part in the whole process. Lot of Linux skills and it was good to brush up my bash skills after a long time. I made a script that can read the last line of the CSV file and then sending the Timestamp, Latitude, Longitude and the Battery status, there are other things like elevation also in the CSV but I don't care about that (unless I am hiking, in that case I will use Garmin). Then in the same shell script I am making a REST call to send these things to my site. I of course enabled the REST API modules that now come with the core and I also installed REST UI. I always get nervous when I use crontab. It is a pain to use it or may be I am not a good Linux Administrator. Well anyways after few hits and trials and way past my bedtime I was able to successfully run the shell script after every minute. So every minute the shell script will update the last known location from the CSV file to my website. Of course it also depends whether my location has be updated or not. When I am not moving the location is not sent. Pretty cool stuff. I do have lot of GPX files store somewhere but I realised using flat CSV files works fine for me but I still want this ability to query my location database. Aaron Parecki mentioned on his site about Compass which he wrote using Lumen framework. I did try using it but was unable to set it up. I was able to get the Compass up and running but I was unable to login using my Known website. I also enable Indie Auth on this site but after few trials I gave up. I am now planning to write my own code to query the flat CSV files. In Compass Aaron mentioned that he can query his location database using API calls which is exactly what I wanted to do. I will definitely write code for this, still not sure which language to use. May be good old PHP? Or Go? Don't know. May be I need couple of days to do this. I hope this was useful and you can try something similar. To be honest I did this with the sole intention to learn something and I really had very, very good Easter break.